The prophet Amos lived among a group of shepherds in Tekoa, a small town approximately 10 miles south of Jerusalem. Amos made clear in his writings that he neither came from a family of prophets nor did he even consider himself one. Rather, he was “a grower of sycamore figs” as well as a shepherd (Amos 7:14–15). Amos' connection to the simple life of the people made its way into the centre of his prophecies, as he showed a heart for the oppressed and the voiceless in the world. Amos was fed up. While most of the prophets interspersed redemption and restoration in their prophecies against Israel and Judah, Amos devoted only the final five verses of his prophecy for such consolation. Prior to that, God's word through Amos was directed against the privileged people of Israel, a people who had no love for their neighbour, who took advantage of others, and who only looked out for their own concerns. With the people of Israel in the north enjoying an almost unparalleled time of success, God decided to call a quiet shepherd and farmer to travel from his home in the less sinful south and carry a message of judgment to the Israelites. The people in the north used Amos' status as a foreigner as an excuse to ignore his message of judgment for a multiplicity of sins. 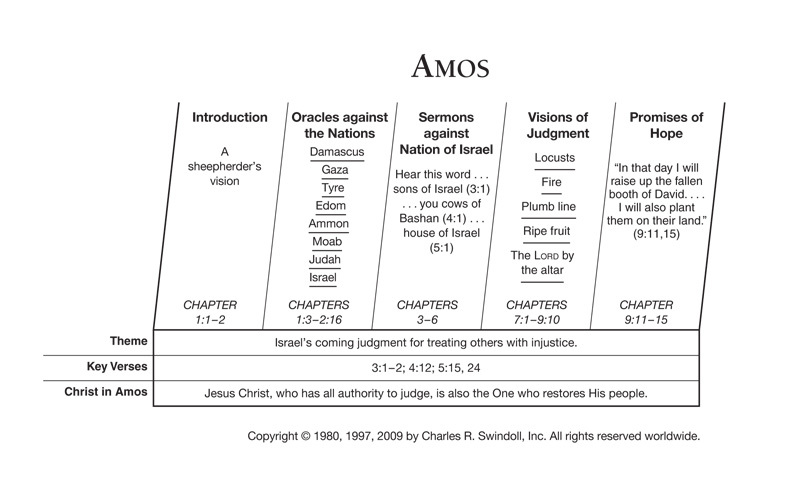 The prophecy of Amos should simplify the choices in our lives. Instead of choosing between prayer and service, the book of Amos teaches us that both are essential. God has called Christians not only to be in relationship with Him but also to be in relationships with others. For those Christians whose tendency has been to focus more on the invisible God than on His visible creation, Amos pulls us back toward the centre, where both the physical and the spiritual needs of people matter in God's scheme of justice. Find resources in the book of Amos in our resource library.